Liz wants Franco to have "the talk" with Cameron, sooner rather than later. Franco doesn&apos;t think he&apos;s the right person for the job, but Liz pushes, so he agrees to do it. Michael asks if Sonny is going after Shiloh. We warns if he does, it will push Kristina away. Michael wants them to leave Kristina a way out and he can get her to the exit line. Michael says he and Kristina are close and she used to him being the voice of reason. Michael promises to be there when she sees the light and needs to get out. Kristina gives Shiloh the recording of her secret. She admits it&apos;s not hers, but a family members. Shiloh listens to it and is grateful she trusted him with it. Shiloh says she&apos;ll be standing by him soon enough, but that she needs to pay her way in. Shiloh says she needs to pay $10,000. Kristina says she has no money, that it&apos;s all in trust until she turns 30. She promises to find a way to pay him. Sam asks Jason how mad he is that Shiloh was with Danny. She explains what happened and points out that Brad was there as well. Jason doesn&apos;t want Shiloh anywhere near Danny again. He knows there are other ways to get Kristina out of DOD. Jason wonders how much longer she&apos;s planning on doing this. Sam gets a call from Shiloh telling her the mentoring is starting now. Sam agrees to head over and tells Jason to give her more time. The teens hang out at Charlie&apos;s. Trina says she saw Josslyn and Oscar at the courthouse and wonders why they were there (oooh, did the two little lovebirds get married?). Josslyn skirts around it. 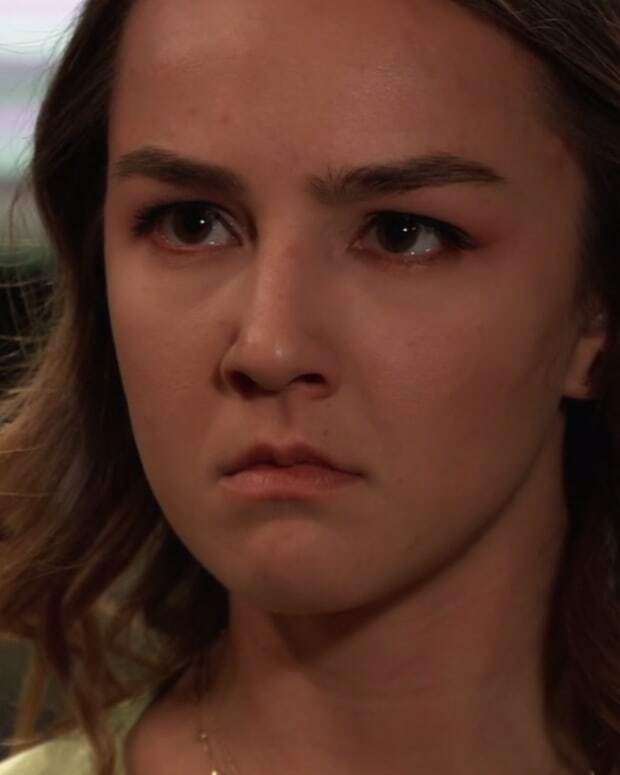 Kristina gets to work and mentions to Julian that she needs to invest in her future. She says she needs $10,000. Michael shows up and offers to help her, no strings attached. Michael just wants her to feel safe with him. Liz asks Bobbie&apos;s advice on parenting boys. Bobbie says her major regret is how she reacted when Lucas came out. Liz brings up Aiden. Bobbie asks if Aiden is gay, but Liz says she just wants him to know that he&apos;s loved. Sam&apos;s session with Shiloh involves him wanting to cover her eyes with a scarf. She pulls back, so he thinks she&apos;s not ready. Sam says she feels powerful and wants to put the scarf on herself. The session involves him standing in her personal space and asking how she feels. Sam claims it feels right. Shiloh abruptly ends the session. Julian spots Margaux with a DOD book and makes small talk about it. He then asks about the investigation into Ryan. Margaux says the case is still open. Julian complains that Ava is terrified and wants the police to get Ryan. Margaux ready to snark out Julian, but then looks at her DOD book and politely says they&apos;re doing everything to find Ryan. Sonny wants to move in on Shiloh now. Jason says Sam is asking for more time. Sonny admits Michael is saying the same thing. He&apos;s worried that Kristina will turn against him if she knows he did something to Shiloh. Sonny tells Jason to give it more time. Sonny thinks he knows someone who might be able to help them (let me guess, Margaux, and they&apos;re going to come back around to a Margaux/Sonny thang). Franco calls Cameron to meet him before his community service for "the talk". Franco talks about mutual respect and how he wants the Webber boys to be raised into better men. He explains about being patient and not pressuring the woman. Cameron is uncomfortable through it all until he manages to make his escape. Julian gives Kristina the money she needs. Margaux arrives at the DOD house as Sam is leaving. She&apos;s there for a class. Meanwhile, Shiloh watches video footage of his session with Sam.